Accurate timing is an integral aspect of sensory and motor processes such as the perception of speech and music and the execution of skilled movement such as playing a musical instrument or dancing. The brain lacks a dedicated system for processing time (unlike sensory systems for processing vision, sound and touch) which makes time perception a challenging problem in neuroscience. I have investigated how time intervals are perceived in sequences that are either temporally regular or irregular. 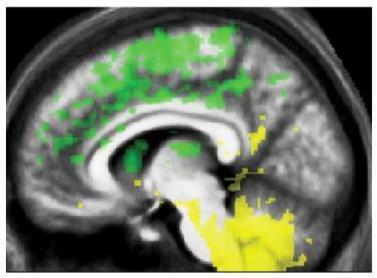 Using functional MRI, I found that perception of time is affected by the temporal structure of sequences - a network based in the cerebellum and inferior olive (in yellow) encodes the absolute duration of single intervals in irregular sequences while a network comprising the striatum, thalamus, supplementary motor and frontal cortex (in green) encodes time in regular sequences with a beat. 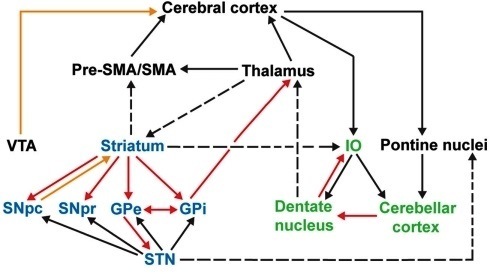 I also developed a unified model of timing suggesting that the striatal and cerebellar timing systems are interconnected and act together to accurately process time. The hypothesis is that the striatal clock acts as the default timekeeper and encodes time in both regular and irregular sequences while the role of the cerebellar clock is to provide error-feedback. This model has been substantiated with neuropsychological evidence from patients with striatal and cerebellar degeneration and is consistent with recent work on interval timing. Distinct neural substrates of duration-based and beat-based auditory timing. Journal of Neuroscience 31(10): 3805-3812. Frontiers in Integrative Neuroscience 5: 90. Annual Review of Psychology 65: 743-71. ﻿Frontiers in Systems Neuroscience﻿ 8: 155. Frontiers in Auditory Cognitive Neuroscience 5: 1329.